I owe a debt of gratitude to two people for this review: first, Mick Vaughan who tipped me off about a stunning deal for the Oomoo sparkling shiraz; secondly, to Chris Plummer whose reviews are always informative, enlightening and well-considered. 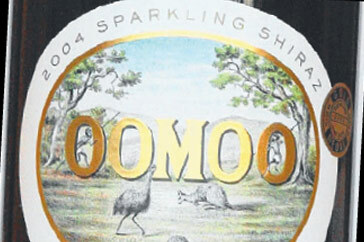 The Oomoo normally retails in the $15 to $25 price range. I got a case for $9 a bottle. The problem in acquiring wines is that it’s hard not to let price be a variable that affects one’s perceptions. Knowing that I got these super-cheap must have had some effect. Interestingly, the back label’s on these are in Japanese. Wine exporter’s pain from a high dollar is my gain, I guess. Held to the light, it’s more transparent on the edges than I had imagined it would be; deep purple transitions to an irridescent brick-dust red. Moderately persistent pink beady bubbles. I had secretly hoped for something a bit more full-bodied; this is a medium-full-bodied wine. The Oomoo is loaded with jammy fruit, with a subtle mintiness throughout (how those two work together I’m stull unsure of!). Hints of chocolate mingle with cranberries, mulberries, a pinch of cherry tartness. Some reviews posit this in the middle of the sweet-dry spectrum; I’d edge it slightly further to the sweet side, but only a little. I should probably lock a couple of these away for a few years (though it’s already 7 years old!). I think Shannon and I are over halfway through the case of these I bought. If I were blind-folded, I’d rate it as a good, par-for-the-course sparkling shiraz. Maybe I’m biased a bit because it was so cheap. At $9 a bottle, it’s stunning 3.5 / 5. Throughout high school, I had dismissed Buffy as being a vampified variation on Dawson’s Creek, an assumption made without having watched it or evidence beyond doubting the tastes of my peers. In about the second or third year of university, I had begun working night shifts at a service station (cash in hand, often 16 hour shifts [longest was 20!!]) and flush with hot cash and hotter pockets had amassed a substantial DVD collection (as some form of alleviation to my employment’s flow-on effects of sleep deprivation, social deprivation, and depressed personability). Having found a copy of Buffy Season 1 for $15 (new), there was little to be lost, particularly for aforementioned escapist purposes. Needless to say, Buffy – as many Joss Whedon fans would attest to – was well-written and far more substantial than (what most people would assume supernatural fare to be) expected. The general “no one understands what it’s like” theme throughout resonated with the coalescing overworked and post-adolescent-youth themes of that cahpter of my life. Not in the mood? Shingleback’s cheapo line put out this stunner. I think the two bottles we picked up were $10 each. Again, maybe the price relative to quality was a factor in it’s reception. Upon drinking the first glass and being impressed with the value, I searched and found it had received numerous positive reviews, including a 94 from Saint Halliday. Kinda changes the implications of “mid-week quoff”.